Would you like to have a standalone page where people can sign up for your email newsletter? With OptinMonster, you can now create a Shareable MonsterLink with a click of a button. What is a Shareable MonsterLink? How to Create a Shareable MonsterLink? A shareable MonsterLink is a standalone page located on one of our domains that serves as an independent URL that you can share through email, Facebook, or other social media, which allows your subscriber to see a specific OptinMonster campaign. To create a Shareable MonsterLink, you first need to have a campaign already created. If you haven’t created your first campaign, then you should do this first and make sure the campaign is live. TIP: Your campaign as a Shareable MonsterLink can still use your Success Actions. What this means is that if you’re using this campaign also on your site, then you may want a different success action. If you’re only wanting to change your success action, you may consider duplicating your original campaign to speed up the design process. Go to your Publish menu, which is located at the top-right of the Builder. Next, scroll down until you see Shareable MonsterLink. Click the icon. Next, you should see a textbox appear below the icons where you will find a link. That link is the Shareable MonsterLink. You can now share that link in your emails, on social media, or add it to your social profiles. When a visitor clicks the link, they’ll be taken to the standalone page where they can signup on your OptinMonster campaign. Looking for more options? 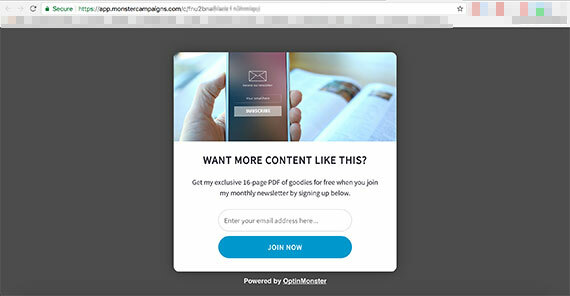 Consider split-testing your Shareable MonsterLinks to improve your conversions! Q: Can I change my domain where my Shareable MonsterLink shows? However, it is not possible to customize the URL of the Shareable MonsterLink at this time. Q: How can I change the success action for when someone signs up? A: The success action is the same success action associated with your campaign. You can edit by reviewing our documentation here. Q: Why doesn’t my shortcode work? A: Shortcodes are processed on your live site where your website is hosted. Since Shareable MonsterLinks are located on a different domain, those shortcodes therefore cannot be processed. In this situation, it is best if you connect to one of our native email integrations or if you embed plain Custom HTML.